Note: If you haven’t been following along with these Object-Oriented Qubbles (OOQs) and don’t know what I’m doing here, then you might which to see OOQ #1 and/or OOQ #2. While I don’t particularly have much of an opinion on the use of “ontology” or “ontologies” in information sciences, I do think it’s pretty damn ridiculous to presume that computer and/or information sciences give a crap about what philosophers think of their use of the terms. Furthermore, I always get irritated with some pedantic traditionalist purports to suggest despite overwhelming evidence to the contrary that words, their definitions, their use, or their spellings can or should be limited to what was taught while the aforementioned pedant was in grammar [graduate, in this case] school. That kind of normativity serves no purpose. I’m not going to rehearse the argument here. For two wonderfully engaging versions, try the Smithsonian’s recent “Most of What you Think You Know about Grammar is Wrong,” or Stephen Fry’s “Don’t Mind Your Language” set wonderfully in kinetic typography here. What the epistemic fallacy identifies is the fallacy of reducing ontological questions to epistemological questions, or conflating questions of how we know with questions of what beings are. In short, the epistemic fallacy occurs whenever being is reduced to our access to being. Thus, for example, wherever beings are reduced to out impressions or sensations of being, wherever being is reduced to our talk about being, wherever being is reduced to discourses about being, wherever being is reduced to signs through which being is manifest, the epistemic fallacy has been committed. (Bryant 60). Graham Harmon, Andrew Pickering, Annmarie Mol, Ian Bogost, and many others all offer similar critiques of epistemology and in so doing argue (convincingly) that most of the history of Western philosophy has been plagued by an epistemological focus that reduces inquiry into reality questions about access to reality. My quibble and key point: by maintaining a vision of ontology as subsidiary to metaphysics, OOO fails to escape the problem of access. Harman’s distinction between real and sensual objects, Bryant’s bifurcation between endo- and exo-qualities all presuppose (even when they claim not to presuppose) some sort of reference object (although a nonhuman reference object) on which sense impressions/ perturbations can land and be registered as qualities/information/sensual inputs. I would argue that these distinctions (endo/exo//real/sensual) are the manifestations of the traditional concern with metaphysics and its never-ending inquiry into essences and accidents. 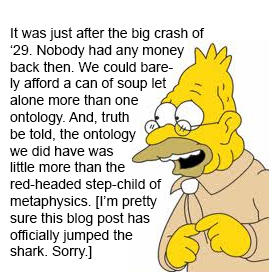 In subordinating ontology to metaphysics, ontology is always about the stuff of reality. Under this model, OOO can investigate the preconditions for being (modes of association/articulation in the Latourian idiom, sites of practice in Mol-speak) and the emergent metaphysics of a particular instance of being (the articulations of that current exist for an object of study), and the subsequent epistemology (how the perturbations produced by that particular instance of being are processed by another particular instance of being as provisionally identified for the purposes of the current study). Of course, one wouldn’t need to go that far. Ontology could be enough. This entry was posted in Musings. Bookmark the permalink. Both comments and trackbacks are currently closed.